In a match where the Polish team Zaksa looked absolutely dominant for periods, Italian champions Sir Safety Perugia pulled a proverbial rabbit out of their hats with a 5-set thriller in the bronze medal match at the 2018 Champions League Final 4. This makes a second-straight medal for Perugia, after silver last year, and guarantees Italy of at least 2 medals, with Lube Civitanova playing for gold later in the day. Poland still is without a European medal all-time. Both teams struggled all day at the service line, with Zaksa serving 19 errors and Perugia 17. Zaksa’s was accompanied by 6 aces, while Perugia had only 1, from American Aaron Russell. A run of intelligent hitting from Zaksa bailed them out from a challenging service result. After a dominant opening set, where Zaksa hit 50% and Perugia just 38, Zaksa had 2 blocks to none for Perugia, and Zaksa had 4 aces to just 1 for Perugia, the Italians fought back in the 2nd to hit 59%. Their own success was coupled by a disastrous set for Zaksa, who had 8 service errors and 3 hitting errors, and still it took Perugia until a 29th point, and fighting off several set points, to win the frame. In the 3rd, Perugia’s offense stayed effective, but Zaksa regained their footing with a run of clever off-speed hitting that befouled and befuddled the Perugia defense. Sam Deroo had 6 of his 21 points in that set, and Maurice Torres had 5 of his 22 there as well. The two rolled their team into the 4th set as well (7 and 6, respectively), but later in this match, Perugia lived up to their billing as the “Block Devils” and deciphered the Zaksa offense, and suddenly became an impenetrable wall. The Italians finished the match with 10 blocks, including 5 from Simone Anzani. Perugia’s star opposite Aleksandar Atanasijevic kept his team alive in the 4th set, scoring 7 of their 18 offensive points on just 10 swings. In the 5th set, Perugia could do no wrong. Zaksa libero, Pawel Zatorski, who was so effective all match, faltered in his passing, and Zaksa hit just 33%. Another 3 blocks from Perugia, including one from Austrian Alexander Berger who entered at 13 points and immediately stuff a Perugia attack, finished the day for the Italians. Atanasijevic had 24 for Italy, while outside hitter Aaron Russell had 14 and Simone Anzani had 13. 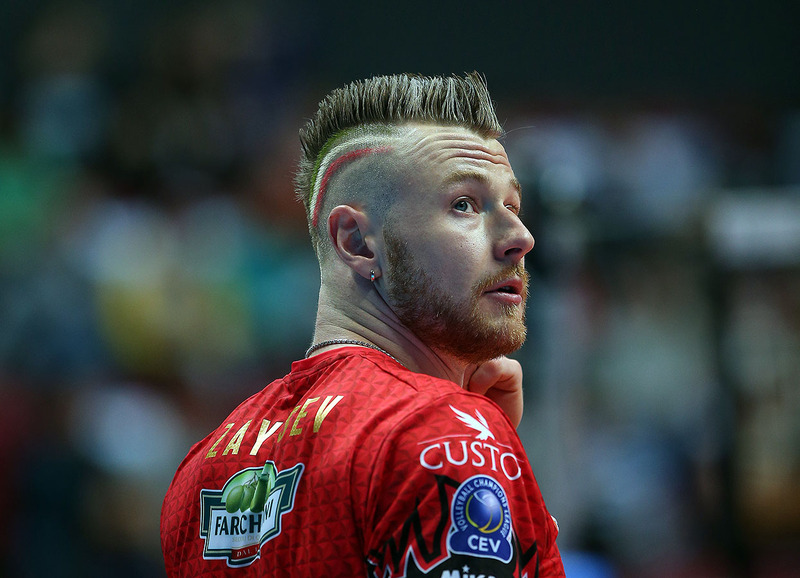 Ivan Zaytsev, who was the team’s statistical torch-bearer in the semi-final loss, had just 8 points and a -3 plus/minus rating in the match, hitting just 29%. He was blasted in the face by a spike in the 4th set, and after taking a blast to the face in the 2nd set, seemed to largely disappear offensively from the match (though he did have a big block in extra points in the crucial 2nd set). He scored only 2 points in the final 3 sets combined in what is likely to be his final match with the team. Perugia hit 52% overall, including 75% in the final set (with no hitting errors nor any blocked shots). Zaksa’s Maurice Torres and Sam Deroo led their team with 22 and 21 points, respectively, while Rafal Szymura chipped in 18. The Poles had 7 blocks, inlcuding 3 each from Lukasz Jungiewicz and Mateusz Bienek. While Zaksa had by-far the edge in the ace department, Perugia still put their opponents off-balance in serve: Zaksa had just 33% positive reception, as compared to 51% for Perugia.